All projects must be delivered and set up between 8:30 and 9:30 on the day of the Expo at NHTI, Concord’s Community College. Early arrivals may have to wait. The NHSEE staff and security will not admit projects outside of this scheduled set up time. Projects may be delivered and set up by a parent, teacher, or other designated person if the entrant is unable to do so personally during that time. The experimenters for each project should be interviewed by at least five different judges. The judges will usually arrive individually. It is difficult to space these interviews equally, so students should not get discouraged if there is a long wait between judges. See Judging Expectations for more information. Projects must be removed from the exhibit halls between 2:30 pm – 3:00 pm on the day of the EXPO. The Exposition is not responsible for projects left after this time. Get information on planning a project schedule, creating a research plan and keeping an experimental notebook. Learn about the various competitions that you can enter. Complete all of the required steps to register for the Expo. The following information provides details concerning when to register. Note: Registration is a multi-step process. It includes the on-line registration, and submitting all the required paperwork to be able to participate in the Expo. On-line registration is usually done after completion of the research plan because a brief description of the planned experiment is included in the registration form. The actual timing can vary, and the following should explain how different parts of the process tie together. If the project needs pre-approval, some paperwork (including a copy of the on-line registration) will need to be sent in by the pre-approval deadline. If pre-approval is required, experimentation cannot start until after approval has been received. For pages of Dates and Deadlines, click HERE. Experimentation must be completed before the final paperwork is sent in. Final paperwork submission includes Abstract, Talent Release Form, other required forms, and payment. Checks must be mailed. 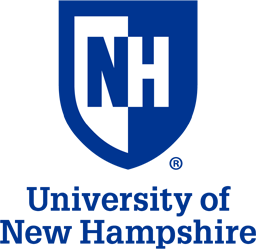 Send to: NHSEE, PO Box 5202, Manchester, NH 03108-5202. They can be made out to NH Science & Engineering Exposition. Submission of paperwork for pre-approval is done after on-line registration. When you do the on-line registration, you will receive an email confirmation. Print a copy of the confirmation and include it with the paperwork submission. Submission of paperwork for final approval is done after experimentation is completed. Fill out the required forms and get any necessary signatures. Include the Talent Release form and a check for payment. Paperwork may be submitted as paper forms, or as electronic files attached to an email. In either case, KEEP A COPY. For either paper or electronic submission, print out all the needed forms, complete them, and get all the required signatures. If you are doing a paper submission, make a second copy of all the completed forms. Send in one set of the forms, and keep one copy for your records. To do an electronic submission, scan the completed forms into a pdf format and email the scanned forms to dstewbiotech@gmail.com. Keep the paper forms for your records. The check(s) for payment must be sent in by standard mail. Registration forms and fees: The registration fee is $15 per person. Iif a project involves two students, the fee is $30; if three students, the fee is $45. 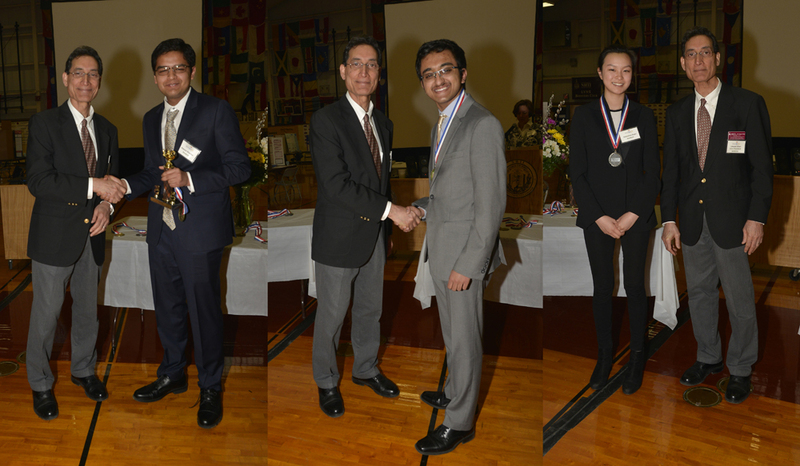 Forms may be sent to: NHSEE, PO Box 5202, Manchester, NH 03108-5202, or electronically to dstewbiotech@gmail.com. 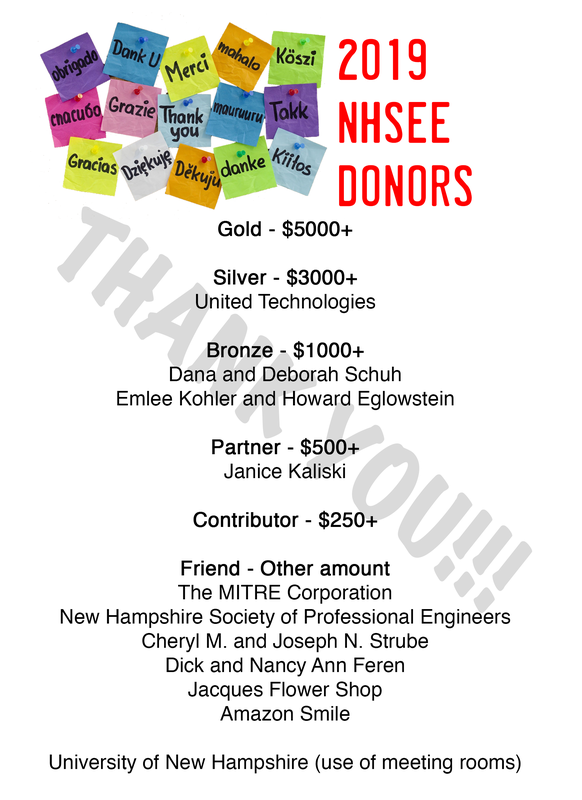 Checks can be made out to NH Science & Engineering Exposition, and they should be mailed to the above PO Box address. 1. If you want to bring visitors to the Expo, we must know in advance because we are very limited for time and space. To register visitors, please go to CONTACT US and select the category “Visitors.” Please include in the contact message how many visitors you would like to bring, and whether they are students or adults. You may quickly get to the CONTACT US page by clicking HERE. 2. Visitors can view the exhibits and talk to students while they are setting up (until judging starts at 10:00 AM), or again after judging is completed (approx 1:00 PM). 3. They could view the exhibits, but not talk to students, during the judging time between 10:00 and 1:00, but must be accompanied by an Expo official. 4. If they want a lunch, it costs $8.00. Homeschooled students are just as eligible as other students. At this time, there is no pre-qualification fair. They can enter directly to this one. The process of registration, application, and approval is the same as for students in regular schools. If a form asks for a teacher contact, a homeschooled student would give the name of the parent/guardian who is doing the schooling.